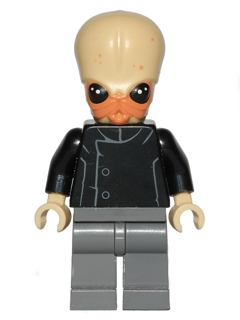 A Bith Musician is a Star Wars-themed minifigure which first appeared in LEGO Star Wars II: The Original Trilogy. In 2014, a Bith Musician was released for the first time in a set, 75052 Mos Eisley Cantina. The three Bith Musicians appearing in the set were later identified as Figrin D'an, Doikk Na'ts, and Tech Mo'r at the 2014 Comic-Con International: San Diego. Bith Musicians are non-playable characters with an all black shirt, grey pants (black in mini-movies), flesh tone skin and a new large head piece. They made up the four musicians at Mos Eisley Cantina, however in the games, there are only three of them, two mouth instrument musicians and a drummer, present. In The Complete Saga game, when music is turned off, they do not play music and instead look bored and confused without their instruments. In LEGO Star Wars: The Force Awakens, "Bith" is a playable character. <gallery> DoikkNats.png TechMor.png LSTF12.png|Bith in LEGO Star Wars: The Force Awakens. This page was last edited on 9 June 2017, at 14:45.